RIPPED FREAK Protein is scientifically formulated to assist energy expenditure to support fat loss and improve body composition! RIPPED FREAK Protein is made up of superior-quality sources of protein and 4 other ingredient complexes that are scientifically designed to help burn calories to support fat loss! Why use Pharmafreak Ripped Freak Protein? Pharmafreak dedicate themselves to researching and developing the worlds strongest supplements, made with clinically-proven ingredients and highest level of GMP quality control standards! Ripped Freak uses a powerful blend of high quality ingredients to give you the best lean protein around to help you burn fat! 6 Sources of Top-Quality Protein! Giving you 20grams of Top Quality Protein to Build Muscle! Low in Fat & Sugar! Buy Pharmafreak Ripped Freak Protein from Fitness Market and save! With our efficient dispatching and quick delivery throughout Australia, Pharmafreak Ripped Freak Protein can be yours sooner. 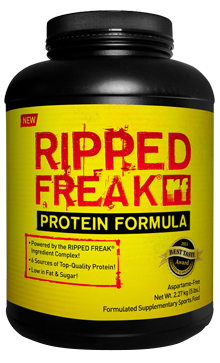 Below you can rate and add reviews for Pharmafreak Ripped Freak Protein.